Make sure you’ve taken every step to protect your pet from the dangers of summer and winter weather conditions. If the owner does not return promptly, call our emergency line (204-982-2020), or the Winnipeg Police non-emergency line (204-986-6222). It is very dangerous, and in some places illegal, to drive with a dog in the back of a pick-up truck. Flying debris can cause serious injury, or the dog may be unintentionally thrown into traffic if the driver suddenly hits the brakes, swerves, or is hit by another car. Dogs should ride in the cab (in a crate or wearing a seat belt harness designed for dogs) or in a secured crate in the bed of the truck. Plant food, fertilizer, and insecticides can be fatal if your pet ingests them. In addition, more than 700 plants can produce physiologically active or toxic substances in sufficient amounts to cause harmful effects in animals. Keep barbeque essentials such as matches or lighter fluid safely away from your pets. Dog bites rise during the summer months when people and their pets spend more time outside. Spaying or neutering your dog reduces the likelihood that he will bite and provides many other health benefits. Provide plenty of water and shade for your pets while they’re enjoying the great outdoors so they can stay cool. If you plan on traveling with your pet during the summer, take the time to prepare for your furry friends in advance. Many airlines have summer pet embargoes, and most trains and ships do not allow pets other than service animals. Pets can get sunburned too, and your pet may require sunscreen on his or her nose and ear tips. Pets with light-coloured noses or light-colored fur on their ears are particularly vulnerable to sunburn and skin cancer. Never apply sunscreen or insect repellant to your pet that is not labelled specifically for use on animals. Don’t take your pets to crowded summer events such as concerts or fairs. The loud noises and crowds, combined with the heat, can be stressful and dangerous for pets. For your pet’s well being, leave him or her at home. The summer can be a wonderful time for you and your pet. It’s also a time where you need to be careful of the dangers surrounding your animal. You can help spread the word by sharing how deadly it is to leave your pet in your vehicle. No Hot Pets is a campaign encouraging pet owners to take their pet with them when they park their car. Share this message and take the pledge today! Let’s have no hot pets this summer! Take the pledge at nohotpets.ca. When the temperature drops and the snow begins to fall, you prepare for the coming winter by getting winter coats, boots and gloves ready for use. Remember that at this time of year, your pet also needs extra attention from you! There is a common misconception that dogs are “fine” when left outside in the cold. This is absolutely not true! Regardless of the breed, or the type of coat a dog may have, all pets need suitable shelter from the elements and insulation against cold weather. Pets should not be left outside for long periods in freezing weather. In fact, during periods of extreme wind chill, pets should only be out for a couple moments to relieve themselves. Like us, our pets can suffer from hypothermia and frostbite. Particularly at risk are young and the senior pets. Dogs and cats are not immune to cold weather. If it’s cold for you, it’s cold for them! Monitor your pets at all times when they are outdoors in below freezing weather. This is especially important for animals who are kept indoors most of the time who will not have adapted to the cold weather by growing thicker coats or toughening up their paw pads. Your pet’s ears and paws are especially susceptible to frostbite in the winter. Frostbite requires immediate medical attention from a veterinarian. Sweaters or jackets are important to short-coated dogs when they are being walked or go outdoors to relieve themselves in cold weather. Boots are also a good idea, just make sure you allow your pet some time to get used to them. Take shorter walks if it is severely cold. 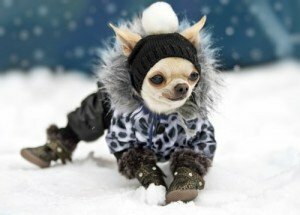 Some small breed, short-coated dogs like Chihuahuas or Miniature Pinschers should not even be walked outdoors in the extreme cold. Never let your dog off leash during a snowstorm. They can lose their scent and become disoriented or lost. An outdoor dog needs a dry, elevated, insulated doghouse with clean, dry bedding and a flap over the door to keep the wind out. Consider adding a dog door to the garage with a soft cushion in the warmest corner. A bowl of frozen water can’t help a thirsty pet! Check outdoor water bowls often when it’s below freezing and break the ice or refill with water as necessary. Consider buying a heated dog bowl. Outdoor pets need more calories in the winter to produce body heat, so increase the amount you feed your pet. On the other hand, indoor pets may get less exercise in the cold months and may need fewer calories to avoid weight gain. Chemicals used to melt snow on sidewalks can irritate paws, so you may need to wipe them with a wet cloth after an outing. Don’t forget their belly either, if they have been lounging on a salted surface. 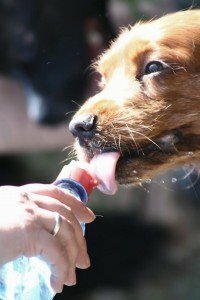 Prevent ice from sticking in-between your dog’s pads by trimming any long fur around his or her paws and rub some Vaseline or oil on them. Just a teaspoon of antifreeze can be deadly to a dog or cat. Roaming animals are more likely to accidentally consume unattended antifreeze and kidney failure can set in within 24 hours. The most likely source of this poison is radiator drainage spots in garages (yours included!) or parking pads. These spots should be flushed with water immediately. Cats should never be allowed to roam outside — in fact it is illegal in most cities. However, if outdoors in extreme cold, a cat may crawl up under your car seeking shelter and warmth near the engine. The cat may get caught in the fan and be seriously injured when the engine starts. Open the hood of your car or slap the hood of your car noisily with your hand before you start the car to startle any sleeping animal there. Don’t leave your pets alone in a vehicle in the cold. Cold, damp weather can aggravate your pet’s arthritis so be extra careful with dogs that suffer from this condition in the winter. Christmas brings all sorts of shiny, dangly decorations. Check your house to ensure there is nothing your cat or dog can get into. Tinsel is of a particular concern as cats have been known to ingest it and require surgery. Chocolate is poisonous to pets! Do not allow them any access to chocolate during the holidays or at any other time. Also, keep holiday plants that are poisonous to your pet out of your home — these include poinsettias, holly, mistletoe and Christmas cactuses.